On Feb 11 2003, a stamp was released in honor of Ghantasala gaaru. For those of us who could not attend, we take great delight in presenting an eye witness account by Sri Gopi Krishna Chebiyyam, an appreciation by Sri V.S.R. Moorthy and some photographs of the ceremony with comments by Dr. Apparao Nagabhyru. 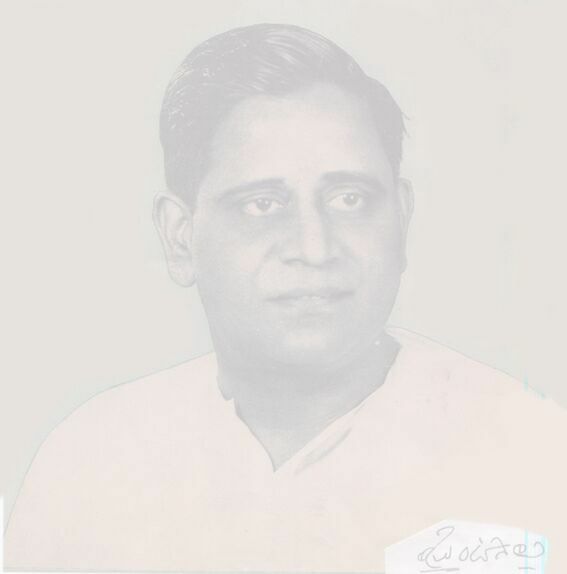 All of these originally appeared on the ghantasala egroup. We also have scans of the first day cover and the brochure issued with the stamps. It was a lovely program organized by Ghantasala Ratnakumar & his family friends at Telugu Lalita Kala Toranam, Public Gardens, Hyderabad. The attendees include Naidu(AP CM), Union Communications Minister,The Post Master General of AP, Smt.Savitri Ghantasala, ANR, Leela,Jikki,Suseela,Janaki,PBS,Ramakrishna,SPB,Anand,Mano & SP Sailaja. But the most delightful thing is: atleast five to six thousand people attended the function(the open air auditorium was almost full) and many more were waiting outside. All the veteran singers sang a song or two(I was not there till the end). Ratnakumar sang "Paaduta Teeyaga Challaga" very well. His voice resembled that of the Maestro. The two promises made by Naidu on this occasion are: moving G's statue from Public Gardens to Ravindra Bharathi & allotting space in Hyderabad for a music college(proposed) named after G.
Coming to the other side of the coin: One complaint the people had was that they did not know that the entry was strictly by invitation only and hence many(especially those who came along with their families) were disappointed when they were not let inside. They also said that the banners and press releases read "all are welcome". I guess the organizers should take enough care to ensure that G's fans won't be disappointed like this. At the ourset plese accept my congratulations and hearfelt ecstasy for the befitting tributes you paid to your father Sri Ghantasala thro "Pitrudevobhava" on 11.02.03 at Telugu Lalitha Kala Thoranam, Hyderabad. This setting is fine, ambience adequate, tingling with sanctity, serenity, tranquility summing up in divinity. The Telugu Lalitha Kala Thoranam, Hyderabad was surcharged with sentiments, emotions, pain and pleasure all rolled into one. It reminds me of a great event in Ramayana immediately after coronation, Lord Rama embraces Hanuma and declares to the world that Hanuma alone could accomplish the task of Rama by virtue of loyalty, trust, faith, devotion, dedication and determination. Accolades Hanuma received from Lord Rama reflect your paying the tributes along with your wife, sisters, daughters and sons of your brother. Being the person closely monitoring the entire saga I have to make the following observations. The way you single handedly handled the State Government, Union Government, the Postal Department, the eminent personalities and the ardent fans and admirers of your father with much ease and poise is commendable. By litting the lamp through your daughter and son of your brother it is demonstrated to the world that the legacy of Sri Ghantasala will be continued and the vitai lampada is passed on from one generation to the other. The decency, dignity and decorum maintained by the audience, spanning over four thousand eight hundred inside and an equal number outside the venue is indeed astounding. Your honoring the artists of yester years holds mirror up to your innate culture of respecting the elders and their tributes to your father are unforgettable and go down in the history as a trendsetter. Despite several lows and highs the ultimate result is complete and heart filling. The mood and moment clearly belong to your father. The programme demonstrated the amount of admiration and adoration your father commanded over sixty years half of which posthumously. Many questions that have been lingering in the minds of millions of your father's fans, why? None from Ghantasala family sang so far. The answer is your renditions and the one song of your sister Smt. Santhi. When your daughter Veena sang, the atmosphere was impregnated with deep emotions love and regard the people had for your father. In organising such a mega event you indeed raced against time, resources and many odds and your coming out in flying colours is nothing but the manifestations of the visible human effort and the invisible divine grace. Making your ailing mother to come to the dais and receive the first album is fulfilling the rightful obligation to the mother. This particular aspect of this event is again "Mathrudevobhava". The honour your father received is unparallel and unique. When your father left for heavenly abode you and three younger sisters had no opportunity to feel his greatness. Equally your father also never had an opportunity to perform even a single marriage. As an observer, knowing your efforts, abilities and love for your father I have to say that you showed to the world what a grownup son could do to the legendary father. I congratulate you for carving out a place in history and making a mark by becoming popular through "Vishwadarsanam" on Teja T.V. Let millions of fans of Sri Ghantasala in India and abroad work shoulder to shoulder and strengthen your hands in realising the unrealised dreams and accomplishing the unfinished tasks of your father. If certain things are missing in executing such a mega event, they are to be ignored and the impact that is generated will neutralise. I with you surge forward and achieve the goal.